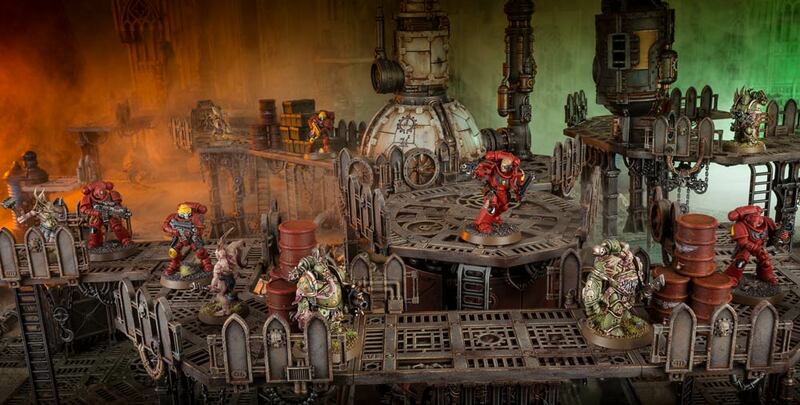 We’ve seen the Sector Mechanicus Terrain set before – it’s the same set that launched with Shadow War: Armageddon. That’s not a bad thing! It’s great terrain and the demand the first time around was apparently pretty good. This set, however, comes in a different color of plastic and is dark brown. If you’re wanting to do some minimal hobby work with it you could literally build and drybrush it and it would look pretty good on the tabletop. 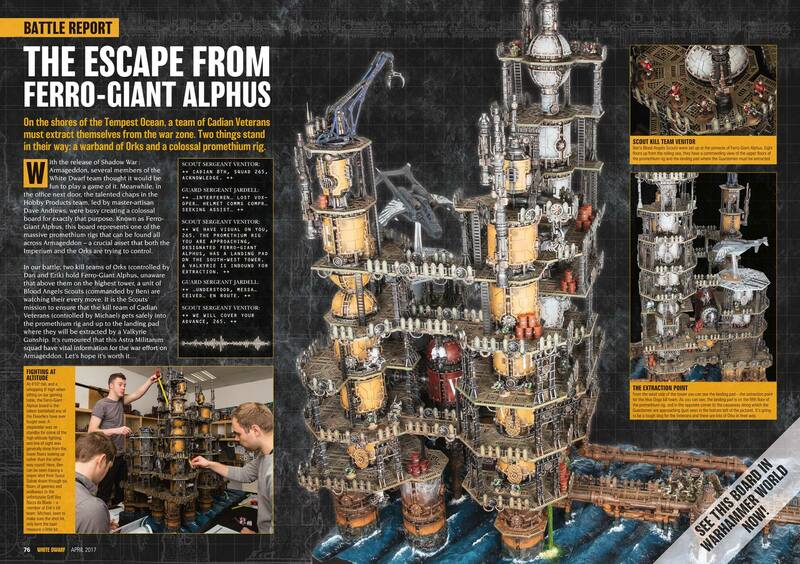 Alternatively, if you really wanted to put some time into it, you could make some pretty impressive terrain. It’s great for those “Crazy-Go-Nuts” terrain projects! Getting a box or two this new Killzone set just for the terrain is a good deal already. However, that’s not all that comes in the box. 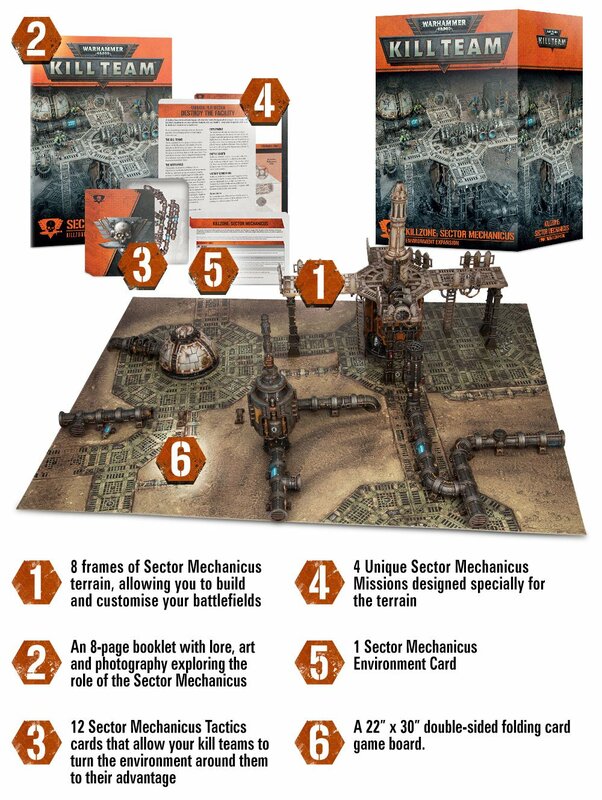 Aside from the terrain you’ll also get 12 Sector Mechanics Tactic cards (think terrain specific stratagems), 4 Sector Mechanicus Missions (think terrain themed missions), 1 Sector Mechanicus Environment Card (think in-game terrain effects), and a Kill Team double-sided game board. The game board is cardboard has a pretty detailed print on it as well. It’s the same 22″ x 30″ dimensions as the one you’ll find in the Kill Team boxed set. One side features a sandy Sector Mechanicus “Rig” and the other features a similar pattern as the Kill Team box. This is great if you want to play on a larger area as you can put them side-by-side and they look appropriate. 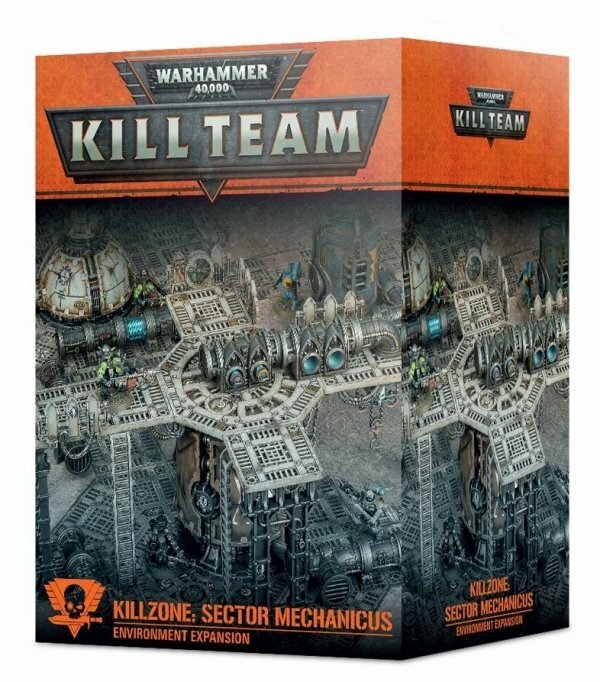 The Sector Mechanicus Killzone is a good, thematic expansion for Kill Team. It’s also a solid addition to anyone’s terrain collection. A lot of the pieces in the set have rules for 40k as well. Or you could just use them like we typically do – as awesome terrain to play on. The Killzone expansion is dropping into pre-orders and retail the same time as the Kill Team launch so it should be available this weekend.